Hostelling International (HI) has announced the best hostels in the world according to their customers. HI’s annual meeting for hostel managers has just taken place in Vienna, Austria and as part of that meeting the prestigious HI-5ives! awards ceremony took place to celebrate the top hostels in the HI network. Hostellers who left ratings on the website hihostels.com during 2011 have now had their say and awards have been handed out in the following five categories: Friendliest Hostel, Most Efficient, Most Comfortable, Best Overall Hostel and Best Hostel Country. The most prestigious award of ‘Best Hostel’ is given to the hostel with the highest overall rating in all categories. Located off the northern edge of Scotland, on the Shetland Isles, Lerwick Hostel (also known as Isleburgh House) was voted best hostel in Europe last year and has gone one better by scooping the top HI-5ives! award in 2011. HI customers love its location with close proximity to local amenities, the beautiful grand mansion house with fabulous views, and commented particularly on the friendly and efficient staff. HI can virtually guarantee you a friendly smile wherever you are welcomed to a HI hostel but this award goes to an outstanding effort in this category. This year’s winner Martha’s Vineyard, an island retreat off the Massachusetts coast in USA, win customers over with their delicious pancake breakfasts, but what shines through are the comments about hostel staff who are continually described as kind, attentive and extraordinarily helpful. This super-modern hostel is located in central Japan and features its own Japanese bath, which is a hit with HI guests! Customers also highly rate the spacious feel of the hostel, comfortable furniture and a peaceful atmosphere in a quiet neighbourhood. Utano Youth Hostel is also conveniently close to sites of interest such as temples and museums. 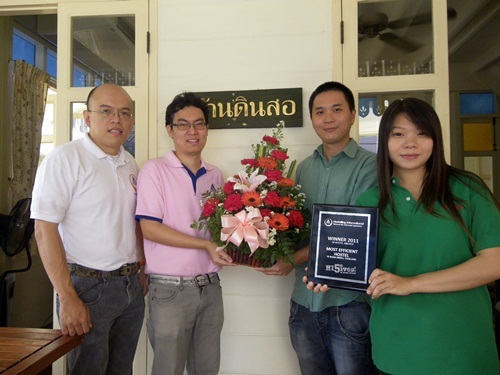 Most Efficient Hostel 2011: HI Baan Dinso, Bangkok, Thailand. HI Baan Dinso is a firm favourite with HI guests who voted it ‘Best Hostel’ in both 2009 and 2010, so it’s no surprise to see it in the winning line up this year. Baan Dinso boutique hostel is described as an oasis of calm in the bustling city of Bangkok. It is praised for the exceptional service and cleanliness once again, but what really makes a difference are the staff, who are always prepared to go the extra mile to make everyone enjoy their stay. The HI 5ive Award “The Most Efficient Hostel” ceremony was held at HI Baan Dinso, Bangkok January 2011 by Nithi Akkaravivat – a hostel manager, Surashing Waewtiangtam – HI Thailand CEO, and Pravee Peter Komolkanchana – HI RDC Asia-Pacific. The hostel was the winner of “The world’s best HI hostel” 2 years in a row, and they could maintain the world class of service and quality to achieve “the most efficient hostel” last year. The 35 hostels in South Africa have pulled in the best ratings overall for a single destination. This is a fantastic accolade for a network which was formed just one year ago. Ranging from fantastic beach side retreats to gateways of some of the best safari parks in the whole world, every SA hostel has something very special to offer an adventurous traveler. All award categories were based on ratings received during a 12 month period, from 1 November 2010 to 31 October 2011. During those 12 months, a minimum of 5 customer ratings in average per month was required to qualify. 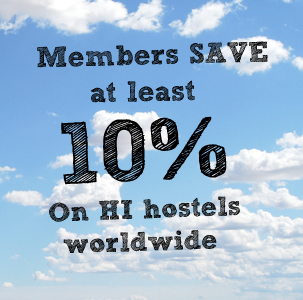 A hostel can only win one award category each year. Let us know what you think and if there are any hostels you know that also deserve a special mention! It’s actually a great and useful piece of info. I am happy that you simply shared this useful information with us. Please stay us up to date like this. Thanks for sharing.